Following local environmental crises affecting children’s health in East Chicago, the local school district, School City of East Chicago, decided to purchase propane school buses as a healthier and less air pollution alternative to diesel. South Shore Clean Cities, an organization that manages the Northern Indiana Green Fleet program for the Northwestern Indiana Regional Planning Commission, guided the purchase. Some industry experts say there has never been a better time than the present to invest in propane vehicles. Others are confident about investment prospects, yet remain cautiously optimistic due to the uncertainty of the global economy, especially in the last decade. However, regardless of one’s position, it is difficult to deny one simple fact: This is rare moment for the propane industry and one that could positively influence it for decades. The Fulton County School System is using this week to showcase the various safety measures it has in place on its buses as part of National School Bus Safety Week. Designated this year for Oct. 22-26, this week allows schools to highlight safety in transportation and celebrate bus drivers. National School Bus Driver Appreciation Day is Monday, Oct. 22, and students and parents across Fulton will honor drivers with handmade cards, signs and special treats. Some industry experts say there has never been a better time than the present to invest in propane vehicles. Others are confident about investment prospects, yet remain cautiously optimistic due to the uncertainty of the global economy, especially in the last decade. However, regardless of one’s position, it is difficult to deny one simple fact: This is a rare moment for the propane industry and one that could positively influence it for decades. Funding is starting to flow now, and 11 states have published and closed funding opportunities representing $159.76 million — with $50 million of that exclusively carved out for school bus replacement. Open, competitive opportunities are published now in Iowa, Illinois, New Hampshire, Pennsylvania, Tennessee and Utah. Additionally, Louisiana and Oregon are currently funding school bus replacement programs on a more discretionary basis. 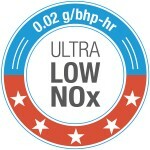 ROUSH CleanTech recently achieved the lowest NOx certification by CARB, at 0.02 NOx. In-use emissions studies, such as the recently published West Virginia University study, are demonstrating that clean-diesel isn’t that clean when used in a typical school bus duty-cycle. Propane reduces the most NOx at the lowest cost. Download our one-pager with some new updates reflecting our 0.02 certification and some total cost of ownership information. NOx is a public health concern, especially for sensitive populations like small children with developing lungs. Arizona, Arkansas, California, Colorado, Connecticut, District of Columbia, Georgia, Idaho, Illinois, Iowa, Kansas, Louisiana, Maine, Minnesota, Missouri, North Carolina, Nebraska, New Hampshire, New Mexico, Nevada, Ohio, Oklahoma, Oregon, Pennsylvania, Rhode Island, Tennessee, Utah, Virginia, Wisconsin and Wyoming. Alaska, Delaware, Indiana, Kentucky, Maryland, Massachusetts, Michigan, Montana, North Dakota, New Jersey, New York, South Carolina, South Dakota, Texas, Vermont and Washington. O’Connor Bus Sales’ Cliff Chase is working hard to educate his school districts on Maine’s cut of the Volkswagen Settlement’s Environmental Mitigation Trust funding. 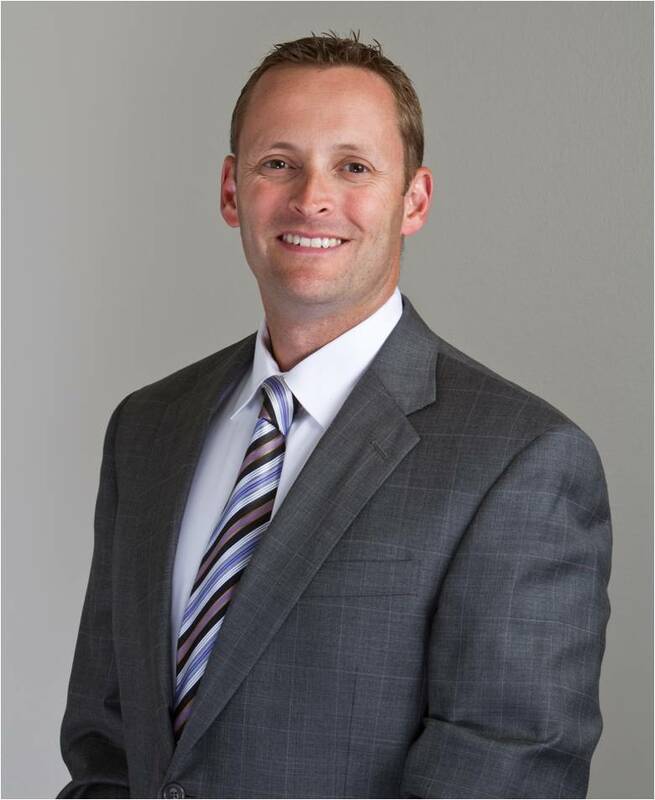 When the application period opened up, his preparation helped many school districts apply for funding in a short window of time. One thing that helped Cliff get the word out about funding was being on the board of directors for the Maine Association for Pupil Transportation. Being active on the board introduced him to numerous contacts. This enabled him to interact directly with decision-makers about funding. As soon as the funding application period opened, Cliff followed up with all of his customers letting them know it was time to take action. He gathered as much information as possible upfront, making it easier on the customer. He also helped with total cost of ownership information to show that propane was the right choice. His customers were responsive and interested in taking advantage of the funds. And, he didn’t keep this information to propane customers only. He focused on all of his current Blue Bird customers — propane or not. Because of this, he had districts reach out to him that are now willing to switch to propane! Cliff also visited a lot of customer throughout Maine to talk about Volkswagen’s Environmental Mitigation Trust funds. He asked ROUSH CleanTech’s Chelsea Jenkins to develop a one-page summary so that customers would have all of the important information at their fingertips. Because of his ongoing communications with customers, Cliff has the potential to sell up to 40 propane units. Great job, Cliff! We look forward to hearing how many propane school buses are sold through your efforts. Q. Was the school district already running Blue Bird buses? A. No. They were doing a buy-back program with IC for over 30 years and had never bought Blue Bird buses. Q. 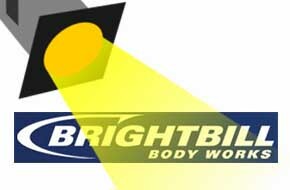 How did you introduce the Blue Bird propane product to them? A. Previously, I had shown our propane demo bus to ESASD in which they expressed some interest. I knew they were on a buy back, but I didn’t want to ignore them. Because, if there was a chance, they might change. The customer told me to stay in touch. I continued to talk with them and let them know that contractors and a neighboring district, Pocono Mountain School District, were investing in propane and using our buses. At my suggestion, ESASD decided to do a two-week trial. They arranged for our bus along with two competitors’ buses to be tested on routes in their area. After the two-week trial, the drivers and mechanics were invited to vote based on performance, comfort and other factors — and Blue Bird won unanimously. We then visited the neighboring district and explored more about the buses and that district’s experiences. ESASD decided to offer a bid and initially awarded us 42 buses. We invited their staff to visit ROUSH CleanTech, and understand more about the product and process. Q. Did the tour of ROUSH CleanTech help with the decision? A. Absolutely. The trip to ROUSH CleanTech solidified their decision for the first 42 buses and then the remainder of the orders. The customers really enjoyed the tour and were impressed by the trip to Michigan. While on the tour, ESASD met other customers that were using the product. They were also able to tour the Ford plant. Our relationship has only continued to get better and it gave us time to really parlay the product to them. Q. What other tactics did you use to further persuade them to move away from IC? A. With the help of Jenna Van Harpen in the Blue Bird Alternative Fuel division, we provided a TCO calculation for the ESASD staff. Jenna assisted me and came out to show it to the board. Prior to the award, David Fink also assisted me with pricing and timeline requests. We provided lots of information about existing buses in the state as references. We also assisted the customer with available grants in our area — something our competitor completely ignored. It was a true team effort and I had lots of help from Blue Bird and ROUSH CleanTech. Our resources dwarfed the competition. We showed ESASD that there would be considerable savings over 10 years with propane buses over buy-back diesel buses. My local ROUSH CleanTech rep, Derek Whaley, was also an indispensable resource and made several trips with me to visit East Stroudsburg. Q. 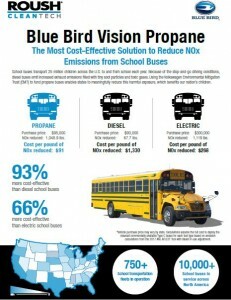 So far, how many Blue Bird Vision propane buses has the school district purchased? A. ESASD has purchased 101 and have 23 more on order. This will complete their fleet and free them from diesel completely. Q. What advice would you have for other dealers? A. Hang in there and continue to highlight the cleanliness of the engine along with the lower maintenance costs over diesel. Going after the 30-plus year buy back was a daunting task at first, but we knew that interest was there and they were looking for a better solution. This customer is now an integral part of my sales to future customers and eagerly speaks to prospects. You can’t get a better reference than that! For one Washington school district, choosing the lowest NOx propane engine on the market made all the difference. Because of the district’s choice, it was able to receive an additional $10,000 per bus from the Volkswagen Settlement’s Environmental Mitigation Trust funding. Now, Bethel School District will be able to add nine new Blue Bird Vision Propane buses equipped with 0.02 NOx engines to its fleet. The school district, which currently operates 28 propane buses, was an early adopter of propane buses in its state. They made their first purchase in 2015 with the help of Brandon Bryson of Bryson Sales and Service. This recent purchase will be the first 0.02 NOx engine buses sold! Like this opportunity for Bryson’s customer, the 0.02 NOx engine can potentially open up more funding opportunities in your state, as well. With this new ultra-low NOx engine option, you can sell the advantages of emission reductions and also the financial benefits from grant funding that can help defray the cost of the bus. 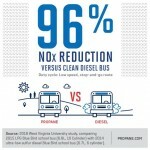 For more information about ROUSH CleanTech’s 0.02 NOx propane engine and its benefits, download talking points here. With a mixed vote at its meeting on October 2, the Board of Education approved amending its contract with All-Star Transportation to allow the remaining diesel buses in the company’s Newtown fleet to be replaced with propane buses in the third year of the contract, 2019-2020, rather than the fourth year.